Rather than limiting third parties' influence, Gov. Andrew Cuomo should work with them to take action on campaign finance reform. Rahm Emanuel was right: A crisis is a terrible thing to waste. Following the arrest of a leading state senator last month, which confirmed every New Yorker’s worst suspicions about the depths of our state’s corruption problem, New York Governor Andrew Cuomo has a rare opportunity to push common sense reforms to get money out of our politics. But, instead, he's seized the moment to push a “reform” that would leave our state’s politics even more dominated by the wealthy and well-connected. The WFP’s grassroots base has either led the charge, or provided heavy artillery, for nearly every economic justice victory our state has seen over the past decade. So it should come as no surprise that now, like its agrarian populist third party forebears, it faces an elite-backed backlash. Now, to be fair to the Governor, he did not propose eliminating fusion voting entirely. Instead, he just called for banning the leaders of third parties from placing candidates on their ballot line without holding primary elections. But that's little comfort. Imagine a scenario in which, say, a billionaire mayor who’s also a media baron decides he wants as many ballot lines as possible and floods the zone with misleading ads in an effort to scoop up the WFP’s ballot line, the Conservative Party’s, and any other line on offer. Given the name recognition advantage of incumbents and major party nominees, and the broken state of campaign finance, it’s not so hard to imagine. 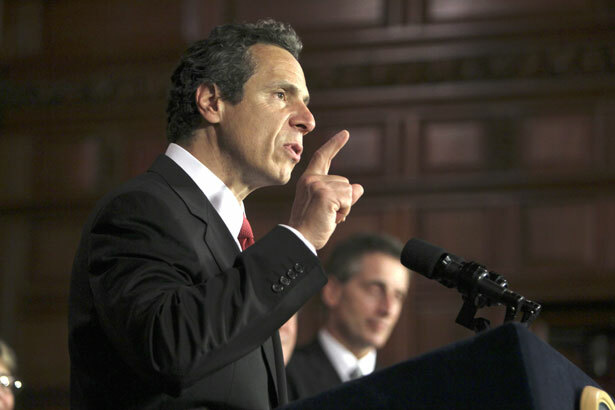 Cuomo’s proposal would strip third parties—which exist in large part as bulwarks against betrayal by Democrats and Republicans—of the right to do quality control on their own candidates. (Keep in mind that the leaders of the WFP are themselves elected by a committee elected by registered WFP voters.) What’s at issue here isn’t the right to run for office—anybody, Cuomo included, can run in the Democratic or Republican primary. It’s the chance for minor parties—a key vehicle for bringing new voices and neglected issues into the process—to choose how best to wield leverage against a broken system. That’s a system that Cuomo can do more to fix. As I noted last month, fusion voting is not what ails Albany (note that the scandal Cuomo has been citing involves a senator’s alleged efforts to buy his way onto the Republican ballot line, not the WFP’s); none of New York’s thirty corruption scandals over the past decade have involved fusion voting. What we do need is serious campaign finance reform, a goal that Cuomo has pledged support for (including recently) but has sometimes failed to back with the political muscle we know he’s capable of. While the Governor was sitting on his hands as the Democratic Party was maneuvered out of a senate majority, the WFP was successfully carrying reform champion CeCe Tkaczyk to an underdog victory. I appreciate that Andrew Cuomo cares about important social liberal causes like marriage equality, but I wish he were equally invested in economic equality. If he were, he would be joining arms with the Working Families Party to pass clean elections, not making their vital work even more difficult. Read Katrina vanden Heuvel on Barney Frank, who sees an opportunity to shift federal spending away from the military and put it into programs that help Americans.